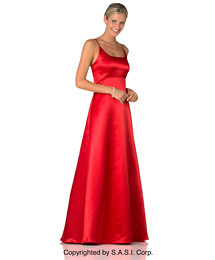 Description: A lace-up strappy back complements this Avanti Satin A-line gown with empire waistline. Coordinates with Silhouettes Flower Girl FL2GL. Accessories: Available in INERNATIONAL EXPRESS Service.